Design by Albert Winslow Cobb. Sydney Thaxter operated SW Thaxter and Co. They were wholesale flour, grain and feed merchants in Portland. He was born in Bangor in 1839. He served as a major in the civil war and was awarded the Congressional Medal of Honor in 1867. In 1907 he was listed as a vice president of the Portland Board of Trade. Thaxter died in November of 1908. He is buried in Evergreen Cemetery. The house fairly conventional 3 bay block of 2 full stories with a 3rd under the garrett. 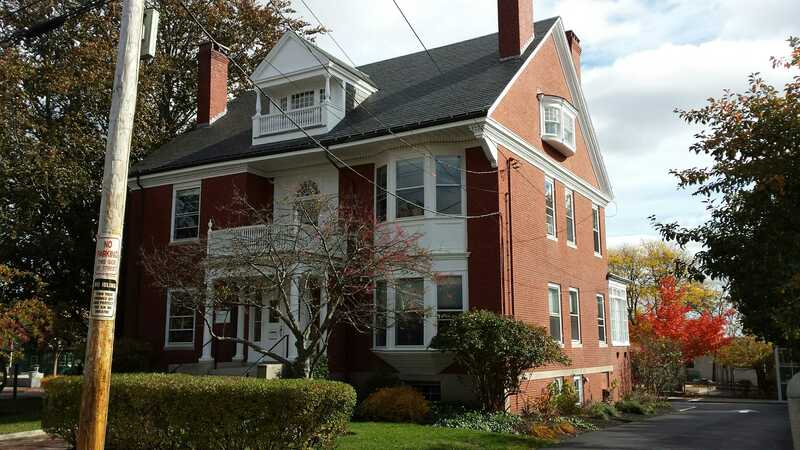 It is constructed of brick with stone and wood trim. The facade is slightly asymmetric with the left bay being wider than the other two. This, combined with the relatively unadorned wall surface of the bay, tends to move the eye to the other side of the composition. The center bay is dominated by the entry ensemble. Starting with heavy granite steps, we move up to a modest landing with the roof supported by nicely formed columns whose Ionic capitals are too small and totally out of proportion. The entry itself is quite plain. Paneled double doors with side lights. The porch roof is gently curved. 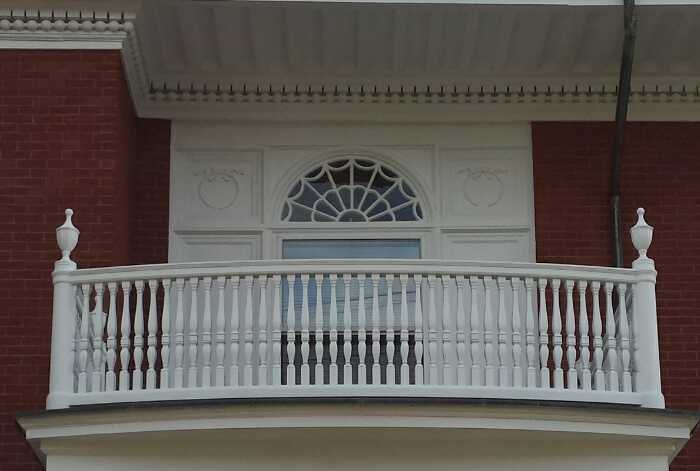 It is capped with a balustrade composed of, too many, slim colonial balusters. The rail is well modeled and scaled. The rounded corner posts topped with classical urns are a nice touch. Behind the rail is a shallow porch and a strongly detailed entry to it. It’s not easy to discern all of what’s there due to the balusters but it looks like a simple door with an elaborate, very colonial, fan light above. This is flanked by paneled sections with the upper units displaying a circle topped with a garland motif. Lastly in the ensemble, we have the third story ‘balcony’. Much to small for anything but a child, it is more of a whimsical flourish on a functional dormer. 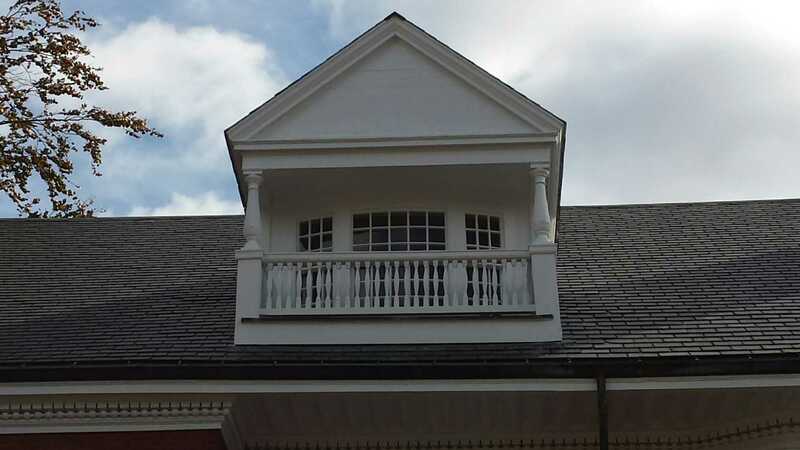 The closed pediment of the dormer mirrors the main gable pediments. 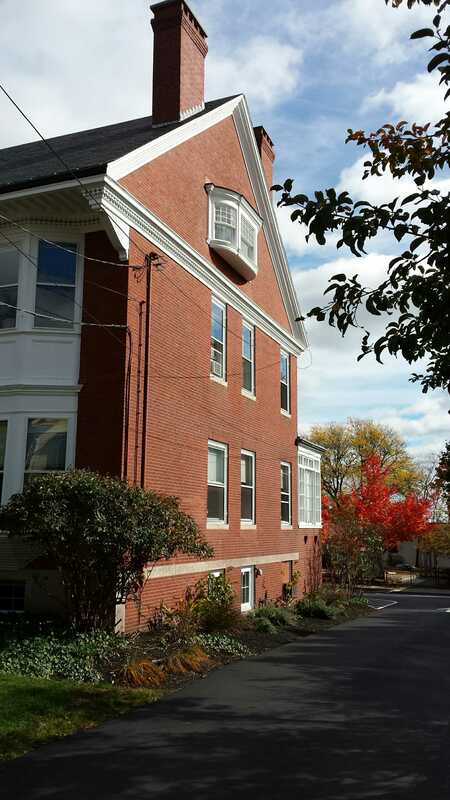 The right bay of the facade has an oriel of 2 stories with a simple, paneled spandrel between the window levels. The right side of the house has a strongly defined water table. The primary wall surface is unadorned. The windows having no surface trim. 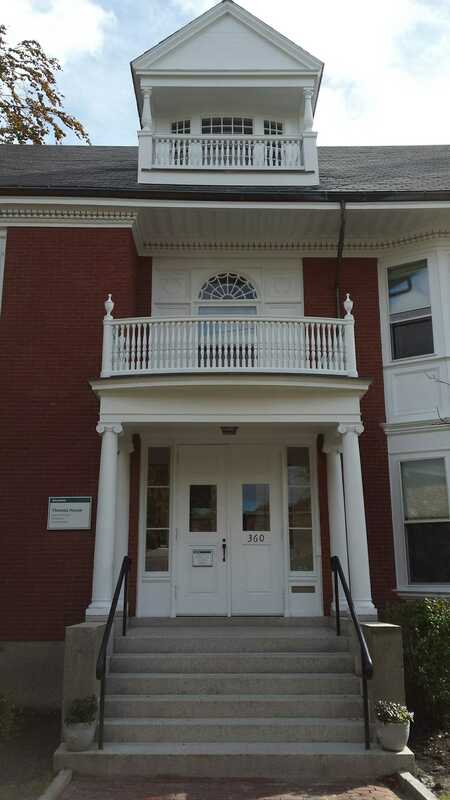 The gable is a heavily defined and molded closed pediment. The bay in the third story is very well detailed and looks like it would make a nice seat for a child. The last detail of interest is on the left wall. Behind the huge Copper Beech tree is an imposing two story window. The first story is simple and somewhat out of place with what is above it. The window is large with clear open sashes in the lower sections. Narrow sidelights with square panes are capped with a diamond motif. These flank a central panel with the same square lights. The upper course of lights create an elongated palladian look with the center, arched, segment being the spring point for radiant lines of the starburst fan window above. Dividing the windows is a very floridly detailed spandrel panel. Sydney’s widow Julia sold the home to Eleanor Lewis in 1919. The owner of record in 1924, Walter Reid, purchased it from her in 1920. Lewis foreclosed on the home in 1932 and sold it to Widgery Thomas in 1936. Thomas sold the home to the Waynflete School in 1968. 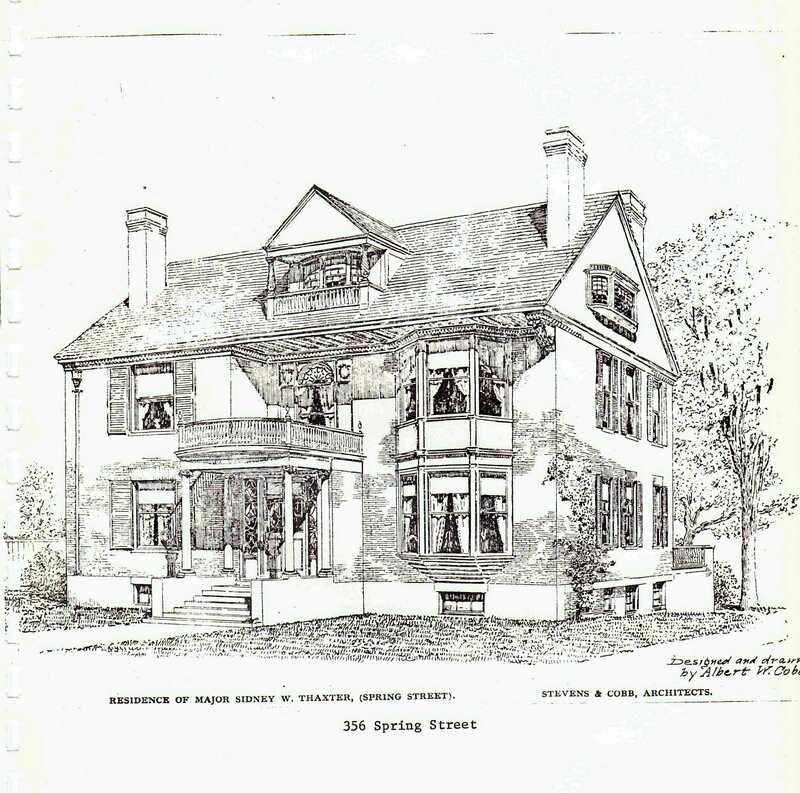 This entry was posted in Albert W Cobb, Architecture, Brick, Colonial Revival, Greater Portland Landmarks, Spring Street, Waynflete School, West End Walks and tagged Albert W Cobb, Albert Winslow Cobb, Architecture, Brick, Colonial Revival, Glimpses, History, images, Maine, Portland, Stevens and Cobb, Waynflete School, West End on November 19, 2016 by alewifecove.